Probiotics are small organisms that help maintain the natural balance of organisms in our digestive tract. They have been considered as important immune system builders for centuries, and are used to help with chronic problems such immune system disorders, IBS, bloating & gas, bacteria overgrowth, antibiotic recovery and stress relief. But you don’t have to wait until a problem manifests itself to start consuming probiotics! Regular consumption of probiotics can naturally boost your immune system and improve your digestion. 1. 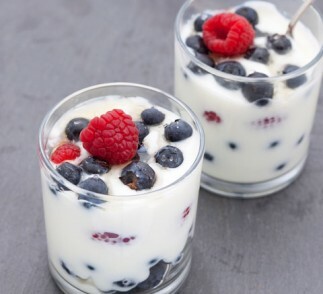 Greek Yogurt is probably the tastiest way to enjoy probiotics! Creamy and smooth, it is a tongue and taste delight. Even plain, it calms the digestive tract and produces a contented, satisfied feeling. But not all yogurts are created equal, so watch out for yogurts filled with artificial ingredients. Instead, for maximum benefits, pick natural yogurts that state “live and active cultures” on the container. 2. Sauerkraut is an Eastern European cabbage dish of fermented cabbage. It’s easy to make and store (just search online for fermented sauerkraut recipes). Traditionally prepared sauerkraut is crisp and much more flavorful than the limp, tired canned sauerkraut we’re all familiar with! Any other fermented vegetable will work, including fermented pickles – those rely on a long, natural fermentation process rather than on vinegar. 3. Kimchi (pronounces kim-Chee), a Korean side dish of spicy cabbage, which has been fermented with red chili flakes, is a popular way in Korea to enjoy Probiotics. Kimchi is found in nearly every lunch box in Asian schools as it boosts the immune system and keeps kids healthy. You can find kimchi in Asian markets and in health food stores. 4. Miso Soup. Popular in Japan, miso is often used in traditional Japanese medicine and in macrobiotic cooking as a digestive regulator. Miso is made from fermented rye, beans, rice or barley. Add a tablespoon of miso to a cup of hot water to make a quick, probiotic-rich broth. 5. Kombucha is a traditional fermented tea from Asia, said to increase energy and help with the stomach’s natural digestion. It’s been gaining popularity n the west and can be found in many health food stores. Kombucha is fermented and comes as a tangy–fizzy drink, or you can make it in your own kitchen with the purchase of a starter. To enjoy the full benefits of probiotics, consume them regularly, and allow at least 2 weeks for their effect to become noticeable.